Everyone knows that at DeeperSonar we love Carp! But not everyone knows that there swims a very special species of carp in the rivers that run through the foothills of the Himalayas on the Asian subcontinent. This wild carp is the “Golden Mahseer” (Tor putitora) also known as the “Himalayan Golden Mahseer”. For some the Golden Mahseer represents the ultimate combination of beauty and power, with a reputation for instinctive intelligence (not unlike big Mirror and Common Carp) this makes large Golden Mahseer very difficult to catch… Couple this with the fact that they live in rock strewn fast flowing rivers and you have a worthy opponent for any Angler. Golden Mahseer are omnivorous, and suitable fishing methods include; Bait Fishing, Lure Fishing, and Fly Fishing. 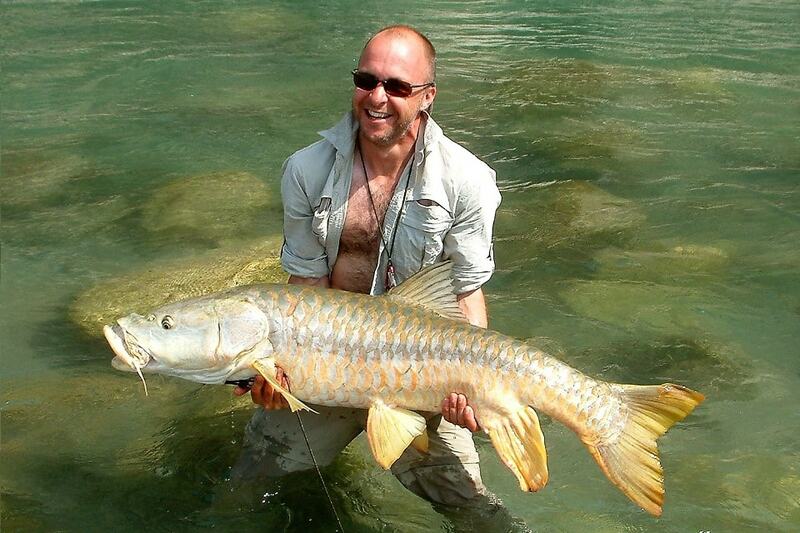 58lb Himalayan Golden Mahseer, caught from and released back to the Mahakali River in Northern India. As well as having the looks, brains, and brawn, the Golden Mahseer is steeped in history and legend in certain angling circles. This is the fish that back in the 1800s smashed rods, reels, and lines when the Colonels and Majors tried to use their salmon gear back in the days of the Raj in colonial India. In the end, tackle-makers such as Hardy’s were forced to build a new range to cope with “Mahseer Power”. Rudyard Kipling, the author of the classic “The Jungle Book” wrote: “There he stood, the Mahseer of the Poonch, beside whom the Tarpon is a Herring and he who catches him can say he is a fisherman”. Deeper Sonar has teamed-up with “The GREATEST Fish” a fishing expedition company that specialises in tracking down, catching, and releasing BIG Golden Mahseer. Reconnaissance trips have started and the GREATEST Fish Team are now utilising Deeper Smart Sonar to help narrow the search, with the ultimate target being hopefully a new IGFA World Record Golden Mahseer.